The UK education minister blames food bank clients for their poverty. The man himself takes, time and time again. "It's often as a result of some decisions that have been taken by those families which mean that they are not best able to manage their finances. What we need to do is to ensure the support is there not just financially but also to make sure that the right decisions are made." Over the Summer OurKingdom ran The Lone Parent Trap, startling work by Rebecca Omonira-Oyekanmi, who spent hours listening to lone parents pushed onto Jobseekers' Allowance by Gove's government. Lone parents are obliged to seek work as soon as their youngest child turns 5; the government says work is the best route out of poverty. Mark, driving his son to school one morning, missed the Jobcentre's call. They docked him one week's Allowance: £71.70. Alison finds it hard to sleep, worries about losing her home, worries about having to live in a hostel, worries about her sons, about finding another job. Worries. "I have an appointment with a lone parent adviser today. I've been offered a job that pays minimum wage, with irregular hours, that I really don't think I can manage. I have another interview today for a better job I hope I get. The stress of it all, is getting to me. Do I explain to the LPA that if I get work, I will need the hot water tank on everyday? I can't go one bath a week if I'm working. And how do you cost up how much more you will need for food? I cook from scratch all the time now. I won't have time when I'm working. I'll have to spend more . . ."
What does Gove know of want, of financial worry, of the fear that stops you sleeping, robs you of your mental health? Michael Gove's adoptive father ran a fish-processing business. His adoptive mother was a lab assistant at Aberdeen University and then worked at Aberdeen School for the Deaf. In 2004 he was selected for the safe Tory seat of Surrey Heath. Harper Collins, Murdoch's publishing house, handed him an advance to write a book about an obscure eighteenth century politician called Henry St John, Viscount Bolingbroke. Nine years on, Gove hasn't delivered. When last year the Guardian asked whether the advance should be returned, Harper Collins replied that Gove "is still committed to writing a book on Bolingbroke but obviously his ministerial duties come first for now". In July 2009, Gove trousered £5,750 for four Times articles that he admitted took him four hours to rattle off. Come August, another £5,750. September, same again. October another £5,750. And again in November. December, same again. That same year the BBC paid him more than £10,000. The Parliamentary House Magazine paid another £5000 or thereabouts. He got another £5,000 from Building Magazine. And so it goes on, more and more, on top of his MP's salary. Gove has accepted donations from a lettings agent, a dental business, an insurance multimillionaire. The United Jewish Appeal Federation of Greater Toronto paid him a £12,260 "honorarium". Jermyn Street shirtmakers New & Lingwood have kitted him out — they do "Relaxed Sophistication". The Royal Opera House has entertained him (four tickets worth £888). They love him in the City. Financiers have paid tens of thousands of pounds to fund his private office. "Shortly after being elected MP for Surrey Heath in 2005, Mr Gove furnished a house in north Kensington, west London, for which he claimed the Additional Costs Allowance. Over a five-month period between December 2005, and April 2006, he spent more than £7,000 on the semi-detached house, which Mr Gove, 41, and his wife Sarah Vine, a journalist, bought for £430,000 in 2002. Around a third of the money was spent at Oka, an upmarket interior design company established by Lady Annabel Astor, Mr Cameron’s mother-in-law. Mr Gove bought a £331 Chinon armchair from there, as well as a Manchu cabinet for £493 and a pair of elephant lamps for £134,50." "He also claimed for a £750 Loire table – although the Commons’ authorities only allowed him to claim £600 – a birch Camargue chair worth £432 and a birdcage coffee table for £238.50. Other claims in the five-month period included Egyptian cotton sheets from the White Company, a £454 dishwasher, a £639 range cooker, a £702 fridge freezer and a £19.99 Kenwood toaster. 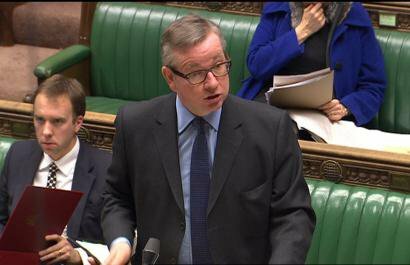 Mr Gove even claimed for a £34.99 foam cot mattress in Feb 2006 from Toys 'R’ Us – despite children’s equipment being banned under Commons rules. He also charged the taxpayer for eight coffee spoons and cake forks, worth £5.95 each, four breakfast knives and a woven door mat worth £30. A claim for new patio furniture worth £219, including a four-seater bistro dining set, was turned down by Commons officials." Let Gove take the shame. Liked this piece? Please donate to OurKingdom here to help keep us producing independent journalism. Thank you. This article benefited from access to They Work for You.